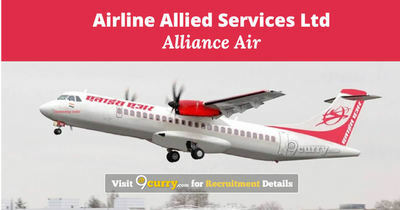 Demand Draft payable to Airline Allied Services Limited, payable at New Delhi. ii) Should have a minimum of 06 years of Aviation experience in Handling Finance/ Account Functions. The experience should be post qualification. 01 i) Graduate from recognized University. Masters in Business Administration from Recognized University/ Institution as additional qualification will be preferred Proficiency in using computers. ii) Minimum 7 years of experience in Airline Flight Crew Training including Minimum two years of managerial experience in an Airline Flight Crew Training. The experience should be post qualification. 01 i) Masters in Business Administration from recognized University with specialization in Material Management or its equivalent. ii) Minimum 5 years of experience in handling Material Management in Aviation The Experience should be Post Qualification. 01 i) Full time 2 years Masters in Business Administration from recognized University with specialization in Marketing or its equivalent. ii) Minimum 5 years of experience in Revenue Management in Aviation/ Hotel industry. The Experience should be Post Qualification. 01 i) Graduate from recognized University. Masters in Business Administration from Recognized University/ Institution as additional qualification will be preferred. ii) Minimum 3 years of experience in Liaison work including doing Liaison with DGCA. 01 i) Full-time Masters in Business Administration from recognized University with specialization in Personnel/ HR or its equivalent. ii) Minimum 4 years of experience in Personnel/ HR in any organization of repute. Experience in Aviation would be preferred. The Experience should be Post Qualification. 01 Graduate from a recognized university and diploma post-graduation in aviation or related field, sales and marketing with minimum 6 years of experience in Aviation/ Travel & Tourism/ Travel Management Companies/ Hotel Industry. The Experience should be Post Qualification. Masters in Business Administration from recognized University or its Equivalent in Sales & Marketing, Business Management or related field, Finance with minimum 4 years of experience in Aviation/ Travel & Tourism/ Travel Management Companies/Hotel Industry. The Experience should be Post Qualification. 01 i) Qualified Associate Chartered Accountant from ICAI. ii) Minimum 4 years of experience in Finance out of which 2 years of experience in airline accounting. ii) Minimum of three years of experience in airline accounting The Experience should be Post Qualification. ii) Minimum 5 years of experience in Catering. Full time 2 years MBA with Minimum 3 years of Aviation experience in handling Passenger Reservation systems in Aviation/ Travel Management Companies. i) Graduation from recognized University. ii) Minimum 05 years of Aviation experience in Airport handling or Sales and Marketing. 01 i) Graduate from recognized University and diploma post graduate in aviation or related field. Masters in Business Administration or its equivalent in Sales and Marketing, Business Management or any related field I Finance. ii) Minimum 02 years of Aviation experience in Aviation. 01 Graduate from recognized University with Minimum 5 years of Aviation/ travel trade experience in handling Sales and Marketing functions. Full time 2 years MBA with Minimum 3 years of Aviation/ travel trade experience in handling Sales and Marketing functions. ii) 03 years' experience in working in a call centre/ BPO of Travel, Hotels, Aviation, Railways etc. ii) 2 years' experience in working in a call centre/ BPO of Travel, Hotels, Aviation, Railways etc. The experience should be post qualification. 01 i) Graduate from recognized University with valid BCAS Basic AVSEC (12 days new pattern) course. ii) Minimum 3 years of experience in Airline Security/ Aviation Security. ii) Minimum 2 years of experience in handling Material Management. Preference would be given for experience in Aviation. ii) Minimum 3 years of experience in scheduling and slots management of an airline. ii) Minimum 3 years of experience in frontline customer service roles, preferably in the travel/ airline industry and in a customer contact environment. Masters in Business Administration or its equivalent Minimum 2 years' experience in Aviation/ Hospitality Sales & Marketing - Sales & Marketing, Business Management, Finance or any other related field. 03 i) Graduation from recognized University with One-year Diploma in office management/ One year certified course of Stenography from a recognized institute. ii) Minimum 02 years of related office management experience in Aviation. Experience in an airline will be preferred. A recent passport size photograph pasted in the space provided in the Application Format. One set of photocopies of supporting testimonials for the date of birth, caste, qualification, experience etc.